This is the first game in the Don Doko Don series. For other games in the series see the Don Doko Don category. 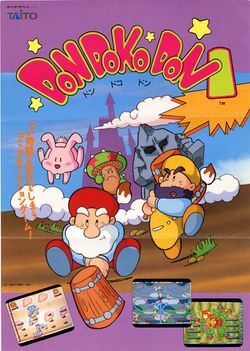 Don Doko Don is a platform arcade game that was released by Taito Corporation in 1989; it runs on the company's F2 hardware, and was later converted for the Famicom and TurboGrafx-16 platforms. A direct-to-console sequel called Don Doko Don 2 was later released on the former system in 1992 - and, much later, a direct-to-PC sequel, Don Doko Don: Manatsu Noko Fundo, was released in 2004. The players must take control of two bearded dwarves named Bob (1P) and Jim (2P), who are armed with hammers with which to kill the various enemies that populate the game's five worlds (each one is comprised of ten levels, for a total of fifty); every tenth level is also a boss level, and if they manage to collect all the secret keys, they will have to play through five additional worlds, for a chance to see the good ending sequence (the bad one, which shall be seen when the game ends in the usual way after the fiftieth level, just says "OH NO! OUR KING IS MISSING! ", before the credits begin rolling). This is similar to: how Bubblun and Bobblun had to collect the seven diamonds for each of the seven regular islands in Rainbow Islands two years earlier if they wanted to play through those three secret islands, and much like that game this one also formed the basis for one stage of the "Parody Mode" of Space Invaders DX (in 1994); Bob also went on to reappear as one of the characters for Pop'n Pop in 1997. This page was last edited on 18 November 2014, at 17:30.